A dog with impeccable sense of confidence, style and a great sense of humour. 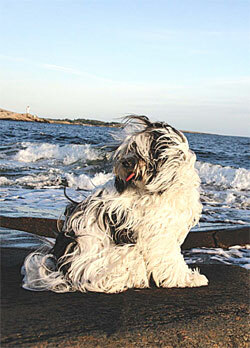 If you are looking for a companion, then the charming Tibetan Terrier is for you! The Tibetan Terrier was ‘discovered’ by Dr Agnes Greig, a young English woman in 1920 in Northern India. She was gifted a Tibetan pup by one of her patients. (The Tibetans valued the breed so much that they wouldn’t sell it, but only give as gifts on rare occasions.) The breed was sent from India to UK and from there to other parts of the world. The breed has evolved over many hundreds of years, closely guarded by the monasteries and shepherds. In fact there is a picture of HH The Dalai Lama with his Tibetan Terrier called “Senge”. For a breed to have evolved in Tibet, means functionality. Every part of the dog has to be in place for him to survive in that harsh environment. Hair falling over their eyes protects them from strong winds and sand particles. They are double coated for protection from both extreme cold and heat. Their full mature coat is an awesome sight to watch when they run. These medium-sized dogs are well-muscled and compact with square proportions. Their tail is set high and is well feathered. It is carried in a curl over the back. The rear legs are strong and muscular to enable the dog to leap from one rock to another. The pads are cat like, with hair underfoot to provide traction in slippery icy conditions. The males mature at 14-16 inches at the shoulder and weigh 14kg. They are available in various colours like black, white, golden, cream, grey, sable, parti-coloured, tri-coloured. Sakhi my girl, is pictured looking as if she is in a natty Tuxedo of Black and White. These dogs are intelligent and can be very funny. Behind all the long coat, lies an impish smile and a heart of gold. “1/3 Dog, 1/3 Cat and 1/3 Human” said an experienced breeder, referring to the Tibetan Terrier. The Tibetan name for the breed is Dho-Kyi Apso, also known as ‘The Little People’. They get along very well with their human family and want to be involved in anything we are doing. They hate being left alone for long stretches. If you are gardening, they would join and maybe pull out a few plants for you. Sakhi, my girl Tibbie, knows how to open the wicket gate between the pantry and kitchen, so we had to add a few more latches. And of course anything with my smell in it, she believes belongs to her as well. My spectacle case, books, T-shirts—never meaning any harm, but what is mine is also hers! No wonder they are called ‘The Little People’. The pups need plenty of toys and stimulation. They do well on good quality dry dog food but also like fresh home food, like Ragi Kanji, Curd rice and occasional Boiled egg or Idli or Dosa. They don’t like very rich food daily. A fresh carrot becomes a good chew. They are great dogs to have around as they are clean, loving and full of fun. They are great watchdogs. The slightest sound of the gate or the front door being opened will get them to bark. Otherwise they are quiet and calm. If introduced properly by their human family, they do well even with children and older people. Basically, they have evolved to get along with people and live in a household. Tibbies have to be brushed and coat maintained regularly. A good quality, pin brush, a slicker, a bristle brush and a de-matting comb are necessary tools. A spray bottle with water and a tiny amount of conditioner should be kept handy to spray before brushing. The 1st year and half are critical in maintaining their coats. They grow through what’s called a Puppy Blow, when they shed their puppy coat, a more mature coat takes over. This is the time when the softer inner coat is also growing well. When the two meet, the coat tends to tangle and mats start to form. Most of what they shed is tangled in the coat itself. But, all this effort is worth it, as after a few years, the coat matures and it becomes the gorgeous style of a true Tibetan Terrier. They are slow to mature, so large amounts of exercise at too early an age maybe over doing it. But they do like long walks with their humans, lots of play with a ball and toys. They like to play fetch, but after a few times, it’s almost as if they are wondering “what is the purpose of this”? Variations in the play routine are required to keep them interested. Their training should also involve variety and no harsh methods should be used for training them. Clicker Training is a great way to keep them interested and be trained at the same time. A good run in a large open space and they will be ready for quieter time. Once they get used to a car, it becomes a favourite, partially sticking their head out, with wind blowing in their face. In fact, my Tibbies love sleeping on my lap on longer journeys. Internationally there are a few hereditary diseases in Tibbies, like Lens Luxation of the eye and Hip Dysplasia. Responsible breeders are careful to ensure that such conditions do not come into their lines. Bandhu and Sakhi had no fear for new places or new people; but they both have different personalities.